Nate Diaz is one of the most entertaining personalities in the UFC. 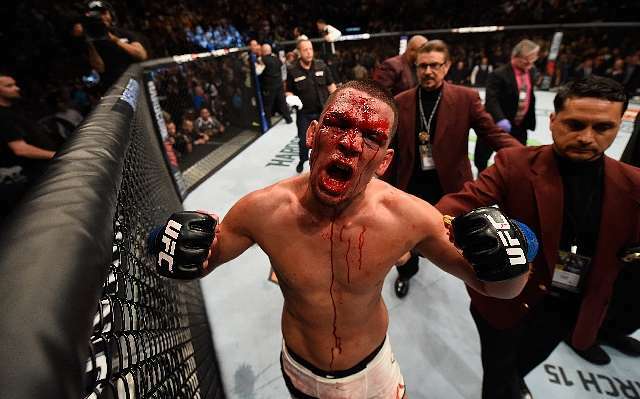 One can only imagine the immense adrenaline, energy and blood pumping through your veins after a cage fight. It’s fair to say that these factors are significantly enhanced in the man or woman who wins the fight. The ecstasy that comes with having your hand raised when months and months of work finally reach their climax or a rivalry is found disputed or even a major event is realised with a major match-up is like nothing else an athlete can experience. Whatever the factors are, there always seems to be an extra ounce of personality that is enhanced by the result of a fight, especially for the biggest characters in the sport. Thanks to these men and women, the entertainment of cage fighting doesn’t stop after the final bell, but sometimes continues onward and into the post-fight interview. Here are the 10 most infamous post-fight interviews in UFC history. The towering heavyweight had spent a majority of his UFC career looking to earn the attention he deserves in the promotion’s scariest division, and he finally realised his long-time goal after his first-round submission of Matt Mitrione at UFC Fight Night 68. In his post-fight interview, he gave a speech that was reminiscent of a Viking-esqe horror film. Perhaps intentional, perhaps not, either way, Rothwell stuck with us after that performance and post-fight interview. UFC 189: What happened on the greatest UFC card in history?